Do you know which canine holds the award for biggest dog breed in the world? We look at the top 10 contenders – let’s find out who wins first place! Our canine companions come in all shapes and sizes, from the tiniest of lap dogs to the largest of guard dogs. But did you know there’s actually a rhyme and reason for the way purebred dogs look and behave? In fact, for centuries, most were deliberately bred to possess certain physical characteristics and temperaments! This means it’s no accident the Great Dane is so great, and the teacup Poodle is, well, so tea-cup. 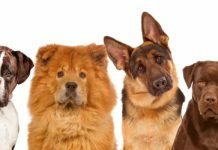 Whether our favorite breeds were used in the past as companion dogs, hunting dogs, or guard dogs, each had and still has a specific purpose and reason for being the way they are. So what about the largest of dog breeds? The ones weighing upwards of 100 pounds and standing at nearly two feet tall? What is the reason these dogs were bred to be so massive and what are the main concerns we should have when considering taking on such a large breed? It’s common knowledge amongst dog-enthusiasts that the larger the dog, the shorter the lifespan. But why is that? Unfortunately, many scientists believe that larger dogs actually age more quickly than smaller dogs, leading to earlier incidence of disease. Not to mention the all-around deterioration that comes with age. 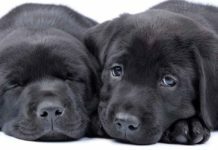 Also, as with most cases of breeding within a smaller gene pool to maintain certain characteristics, large purebred dogs are susceptible to inheriting hereditary conditions. And in general, larger breed dogs are more prone to orthopedic issues such as hip and elbow dysplasia, arthritis, and digestive issues such as Bloat. Still, as dog lovers, we can’t help but have an affinity for these massive breeds. Read on to learn about ten of the largest dog breeds in the world and find out who takes the cake for the largest dog in recorded history! 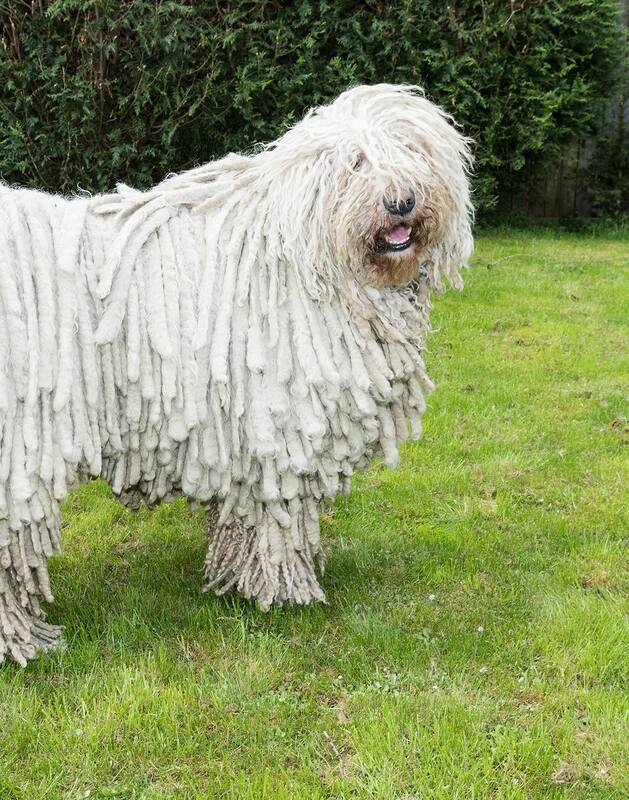 Also known as the Hungarian sheepdog, the Komondor first made an appearance in Hungary with the nomadic Cumans people who settled there around the 12th century. This large dog breed was used primarily for guarding livestock and is still a very popular dog in Hungary today. In fact, the Komondor is considered to be one of their national treasures and is protected from being modified. This is a large dog from the Molosser family. They are a muscular breed with long legs and a unique, white corded coat. In fact, some even call this breed the ‘Mop Dog’! This big dog breed was created to be an independent thinker. They have a natural protective instinct and are therefore very defensive of their home and family members. Like most large dog breeds, the Komondor is not a good apartment dog and will do best in homes with a large securely fenced-in yard. And owners should also make sure they are adequately exercised. They are a fearless yet affectionate dog, known for their gentle nature and fiercely protective instincts. The Komondor does well with dogs they were raised with but may be more wary of outside animals. Because of their size and protective nature, Komondors require early socialization and consistent training throughout their life. The Komondor has a lifespan of 10 to 12 years. Although overall healthy dog, the Komondor’s large size can make them predisposed to hip dysplasia, entropion, cataracts, and Bloat. 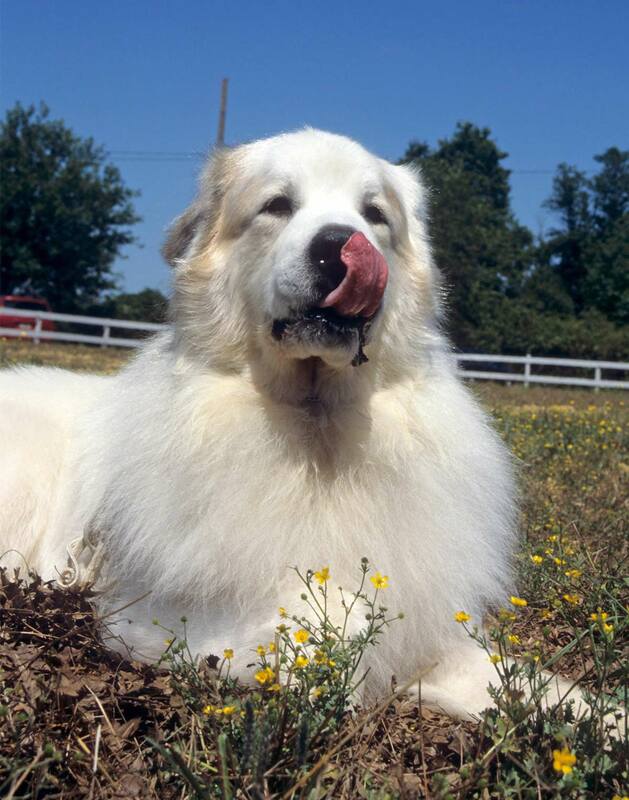 The Great Pyrenees is an ancient breed that has been around for hundreds of years. They accompanied the Basque People who are indigenous to regions around the Pyrenees Mountains of Southern France and Northern Spain. This large dog breed was mostly used as a livestock guardian, bred to protect sheep from predators such as wolves and bears. They are believed to be essential for shepherds and farmers, are naturally courageous, and excellent defenders of livestock. The Great Pyrenees is a smart and fearless big dog breed known for an affectionate, calm, and patient demeanor. A thick, white, weather-resistant coat helps keep them protected in the harsh mountain conditions they were bred to work in. Although the Great Pyrenees is still used to protect livestock, they also make a wonderful companion dog. They are known to do great with children and families but can be slow to learn as they have a stubborn streak. It will take a committed and patient owner to get this large dog breed to pick up new tricks. One of the main ways the Great Pyrenees protected his flock was by barking, so they also quite vocal. Moreover, they enjoy cold weather, especially snow, and don’t tolerate heat well. Prospective owners should be aware that this large dog breed is prone to wandering away when left off the leash. The Great Pyrenees has a lifespan of 10 to 12 years. They are prone to hip dysplasia, tricuspid valve dysplasia, osteosarcoma, persistent pupillary membranes, progressive retinal atrophy, cataracts, osteochondritis dissecans, patellar luxation, and Bloat. 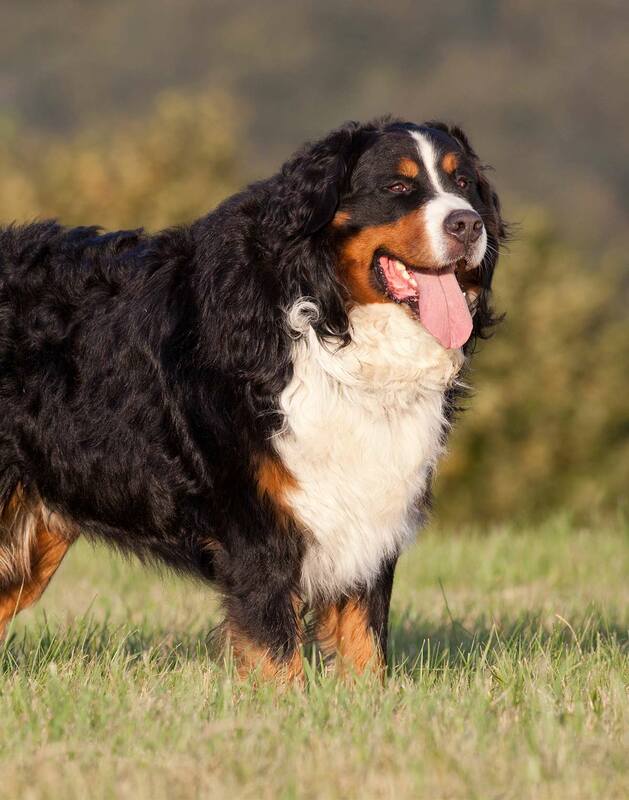 One of four breeds of the Sennenhund-type, the beautiful Bernese Mountain Dog hails from the Swiss Alps. The main job of the Bernese was to accompany Alpine herders and dairymen. They were also used as farm dogs and often seen hauling and herding animals such as cattle and sheep. The Bernese Mountain Dog is famous not only for their size but also their beauty. The thick, fluffy double coat has distinctive markings of black, white, and tan, and although gorgeous, sheds profusely! They need to be brushed at least twice a month and raking can help remove loose hair. The Bernese Mountain Dog is good-natured, confident, and affectionate. They perform excellent with training, however, their large size means they will require exercise and activity all throughout their life. This is a real outdoor dog who loves nature, hiking, and cold weather. The Bernese do well with children and other household pets but ss with all large dog breeds, socializing is a must early on and all throughout their life. This big dog breed has a lifespan of 7 to 10 years. 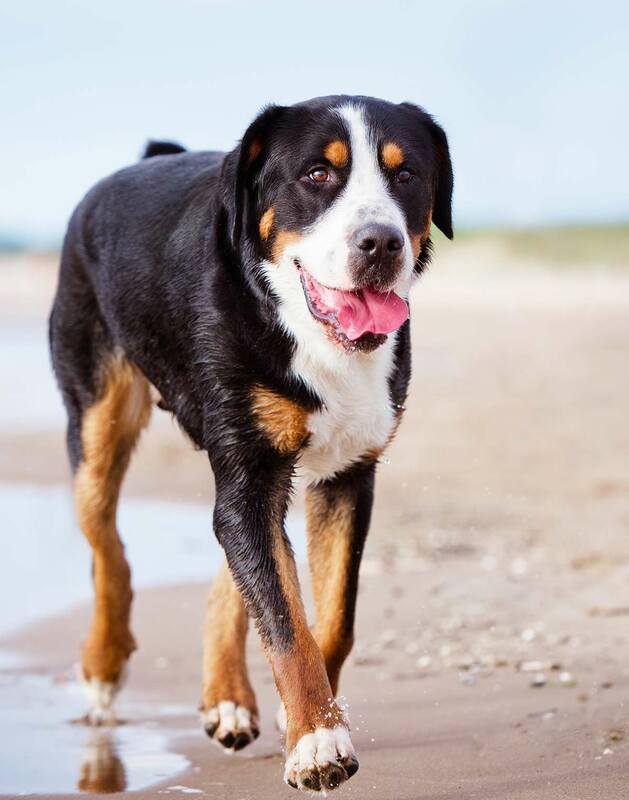 The Bernese Mountain dog is prone to hip dysplasia, elbow dysplasia, gastric torsion, and mast cell tumor, and can also be prone to heat stroke in warmer climates. The Irish Wolfhound is a very large sighthound who hails from Ireland. Although their appearance is quite wolf-like, the name is actually derived from their use as a wolf hunting dog! It has been said that this large shaggy dog breed was originally developed from war hounds. 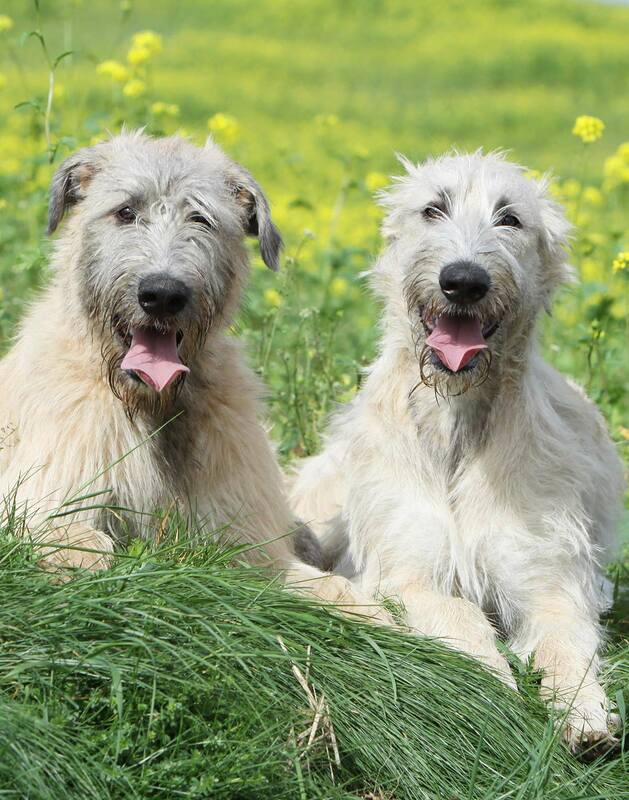 The Irish Wolfhound is an incredibly old breed, with artifacts dating back to around 7000 BC. At 32 inches, this tall dog breed has a muscular build similar to that of the Greyhound, with a coat that is harsh, wiry, and often referred to as wolf-like. Their coat comes in white, black, brindle, and fawn. This breed has a wide range of personality traits that vary from one dog to another. However, most Irish Wolfhounds are known to be sweet, faithful, and patient. They bond strongly with their humans and other dogs raised with them and can be very protective of their family. However, if left alone too often or for too long, they can become destructive and depressed. Wolfhounds are very good with children and easy to train. Of course, we still recommend early socialization and training due to their size and protective nature. The Irish Wolfhound has a lifespan of 6 to 10 years and is prone to dilated cardiomyopathy, bone cancer, bloat, and portosystemic shunt. The Bullmastiff was first introduced in Britain during the mid-1800s, where they were primarily used to guard property and keep poachers at bay. They were also adored by gamekeepers, who bred them mostly for their strength, size, and speed. This heavy dog breed is said to be a cross between the bulldog and Mastiff, hence the blended moniker. Massive and muscular, the Bullmastiff keeps growing until nearly four years old! They have a short coat that lies close to their body and comes in fawn, red, or brindle. Although they are known for their brawny strength, this is a sensitive dog who will need a firm but loving owner. 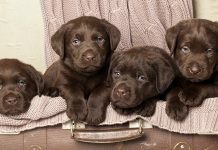 They will also need consistent training and socialization early in their puppyhood. Training will require patience from the owner, as this large dog breed is an independent thinker and does not enjoy repeating tasks on command. 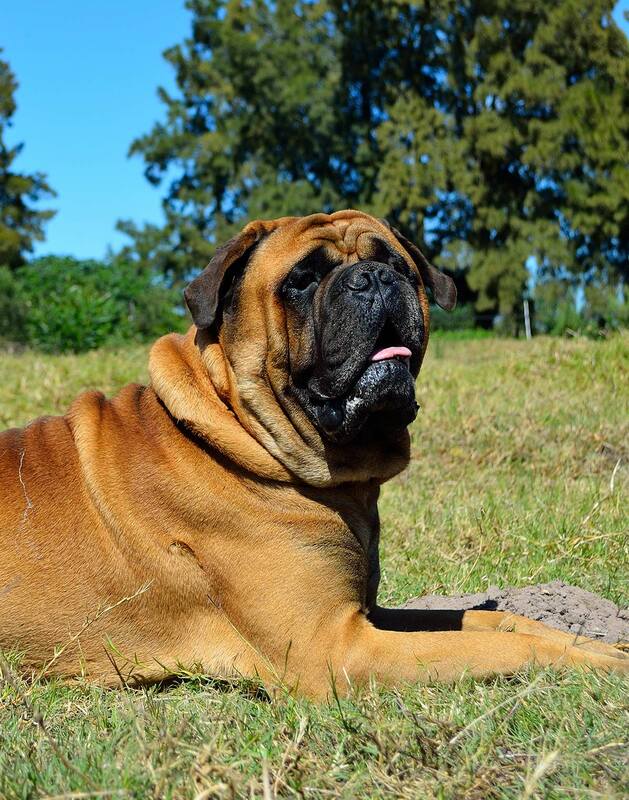 The Bullmastiff has a lifespan of 7 to 9 years and can be predisposed to hip and elbow dysplasia, entropion, hypothyroidism, lymphoma, progressive retinal atrophy, arthritis, and Bloat. This enormous dog breed hails from Newfoundland, Canada, where they also get their name from. They were originally bred as a working dog for fisherman and are known as much for their giant size as for their heroic actions as rescue dogs in more modern times. They are particularly good at water rescue due to their water-resistant coat, webbed paws, and miraculous swimming abilities. 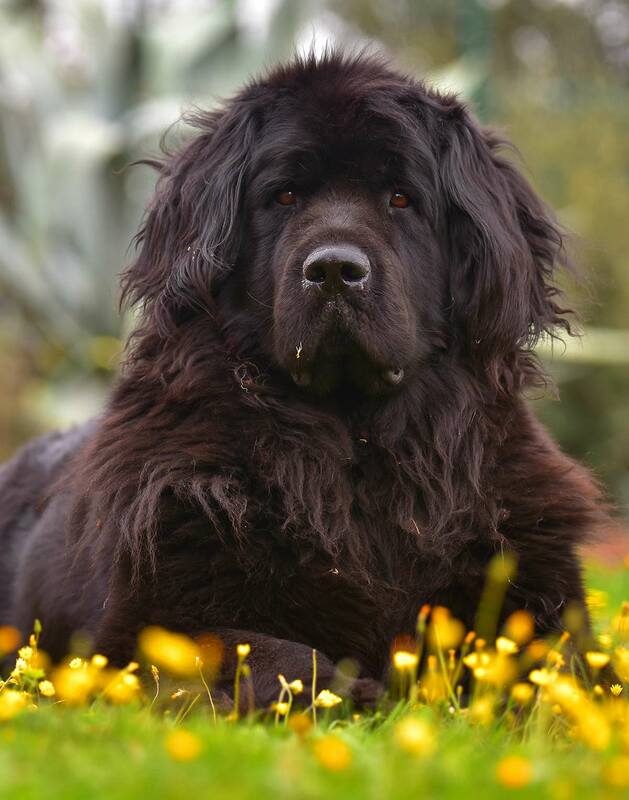 Also known as ‘Newfs’ or ‘Newfies’, the Newfoundland is from the Mastiff family, so it’s not surprising they are large, big-boned dogs known for strength and power. They have a long, fluffy coat that only adds to their massive appearance. The coat comes in black, brown, or white and black. Despite the impressive, bear-like physique of the Newfoundland, this large dog breed is even-tempered and famous for his family-friendly disposition. This makes them a wonderful companion dog. In fact, their reputation for being good with children is so great that they are often referred to as a ‘nanny dog’. This is an intelligent breed who is trainable and eager to please. Still, early socialization and training is key to a happy, healthy relationship with all large dog breeds. The Newfie has a lifespan of 9 to 10 years. 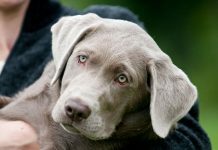 They are prone to numerous health conditions including sub-aortic stenosis, cystinuria, canine hip dysplasia, epilepsy, hip and elbow dysplasia, and von Willebrand’s Disease. They are also susceptible to cataracts, osteochondritis dissecans, entropion, ectropion, cruciate ligament rupture, and bloat. This is an ancient dog breed, once used by local Tibetan tribes to protect sheep from large predators such as wolves, bears, tigers, and leopards! Intelligent, aloof, and watchful, this large dog breed can be considered the ultimate guard dog. They are gorgeous but imposing, with naturally protective instincts and an incredibly dense coat that will require constant grooming and care. 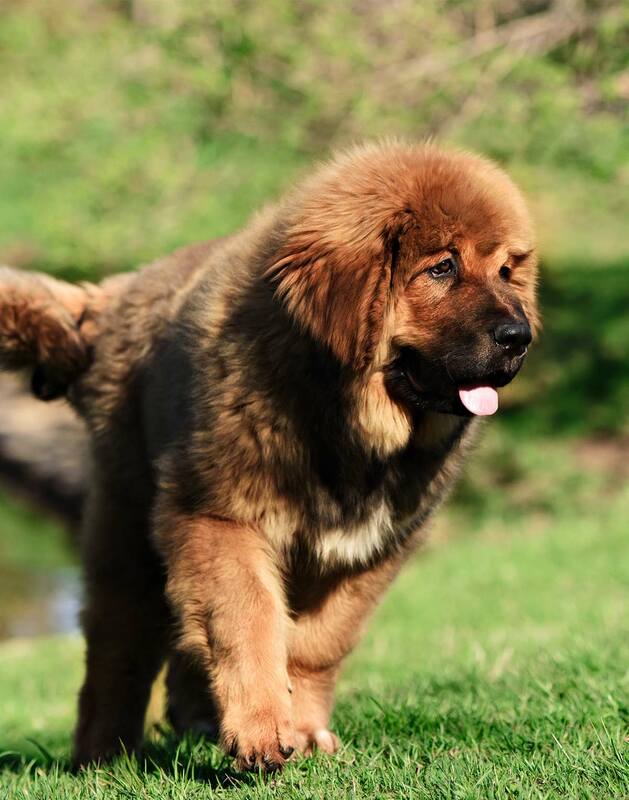 Because of their guarding instincts, the Tibetan Mastiff will need early socialization and training from a patient and committed owner who is loving but consistent. It’s also important to keep in mind that this is an independent dog who will test you, and they will get bored if they don’t provide adequate mental and physical stimulation. The Tibetan Mastiff has a lifespan of 10 to 12 years. They can be predisposed to hypothyroidism, entropion, ectropion, distichiasis, Demodex, Addison’s disease, and Cushing’s disease. In addition, they are prone to malocclusion, epilepsy, progressive retinal atrophy, cataracts, ear infections, and hip and elbow dysplasia. Known as the ‘Swissy’ by enthusiasts, the Greater Swiss Mountain Dog hails from the base of the Swiss mountains. Here, they were mostly used to drove cattle and guard property and their family members. The Greater Swiss Mountain Dog was also used as a herding and pasture dog. This is a beautiful large dog breed who is considered to be the embodiment of the word ‘majestic’. 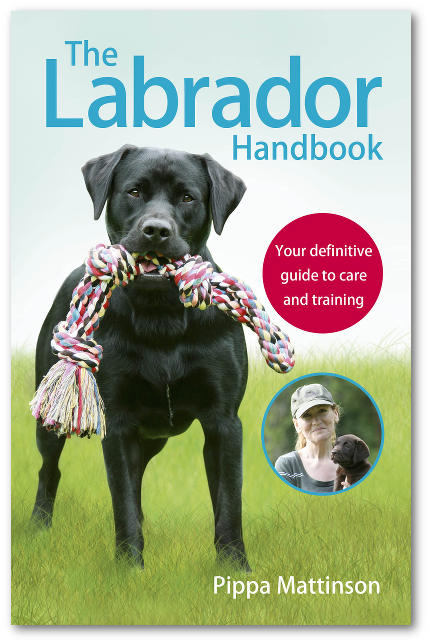 Loyal, affectionate, and reliable, this large dog breed is incredibly strong and hard-working. They are happiest around family and do very well with children. They are also incredibly social and very active. Because they are so active, the Swissy needs plenty of room to exercise. Luckily, they are easy to train since they are so intelligent, making them very quick learners. Despite their intelligence, this large dog breed can be difficult to housetrain—sometimes taking as long as six months. They also need to be watched carefully as they are prone to eating things, edible or not. 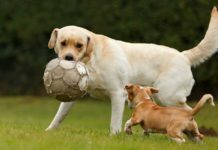 The Swissy needs early socialization and consistent training to ensure they know how to behave around other dogs and people. The Greater Swiss Mountain Dog has a lifespan of 8 to 11 years. They are predisposed to hip and elbow dysplasia, Panosteitis, osteochondritis dissecans, distichiasis, and gastric torsion. Officially registered in 1846, the Leonberger hails from Germany and was deliberately bred to resemble the coat-of-arms of Leonberg, the lion. They were also a popular companion dog with a regal appearance that made them coveted by those of royalty. Mostly though, this large breed was used as a working dog, pulling carts in Bavaria and helping to keep livestock thieves at bay. Nicknamed the Leo, this heavy dog breed is renowned for their grace and gentle nature. They are friendly and playful and do well around both adults and children. They have lion-like in appearance, with the most prominent feature being the ‘mane’ that grows around their neck and chest. Their coat is likely their biggest imposition, requiring regular brushing and grooming since they shed profusely. 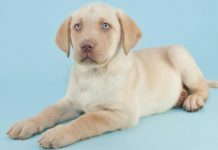 The Leo will also need lots of space and time to play and exercise and, as with all large dog breeds, they will need early socialization and training. 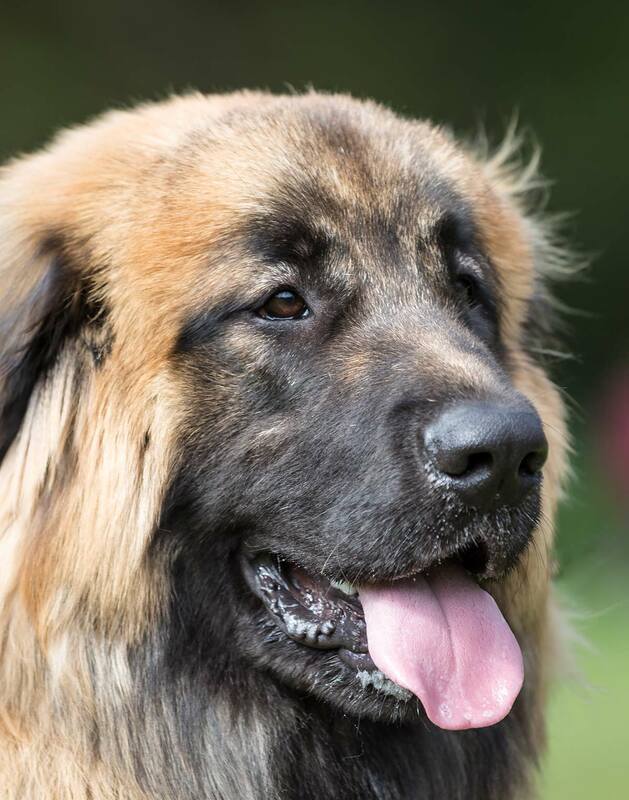 The Leonberger has a lifespan of 6 to 9 years and is prone to hip and elbow dysplasia, osteochondritis dissecans, Panosteitis, cataracts, entropion, and ectropion. Although the earliest depictions of this massive dog breed come from ancient Greece and date back as far as the 14th and 13th centuries BC, their official origin is Germany. 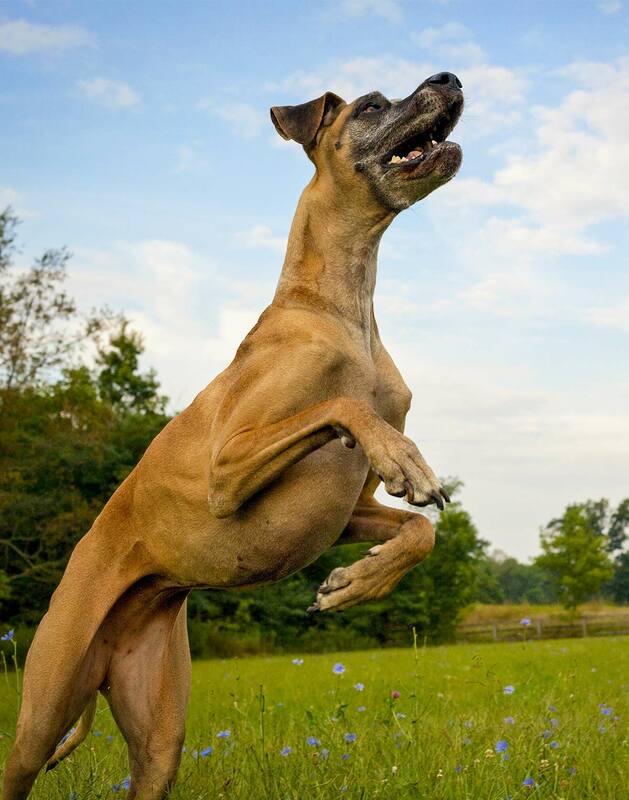 The Great Dane was used as a working dog, renowned for their ability to fearlessly hunt boar, bear, and deer. They also have royal roots and were once known as ‘chamber dogs,’ given the job of protecting sleeping princes. The Great Dane is an even-tempered dog described by those who know them as a joy, though they don’t shy away from admitting they are a whole lot of dog! They are as strong as they are sweet, and can make a wonderful guard dog—no one would be foolish enough to intrude when one of these giants is at home! Although this large dog breed can make a good family pet and does well with children, they should always be supervised because of their huge size. The Great Dane, as with all large dog breeds, will need to be trained and socialized early on to maintain a happy, healthy companionship. 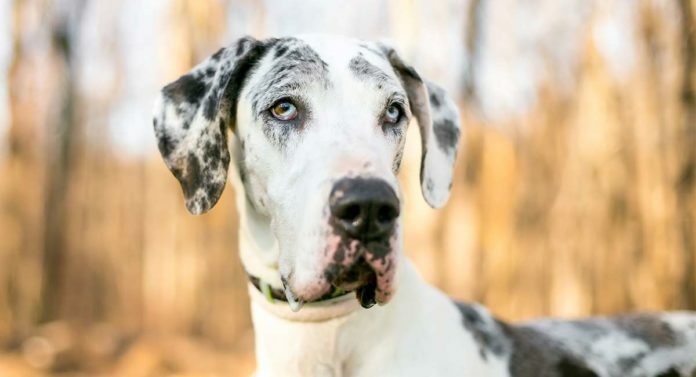 The Great Dane has a lifespan of 7 to 10 years and can be prone to hip and elbow dysplasia, arthritis, Wobbler syndrome, dilated cardiomyopathy, hypothyroidism, and bloat. So, What’s the Biggest Dog Breed in the World? The biggest dog breed in the world is officially the Great Dane! In fact, the tallest dog breed on record is a Great Dane named Zeus. Zeus was raised in Michigan and went down in the Guinness Book of World Records as the largest dog in 2012-2013, measuring 44 inches from paw to shoulder. Standing on his hind legs, this giant stood at 7 feet tall! Sadly, Zeus died at five years old, which, as we previously mentioned, can be considered old age for such a large breed. To this day, Zeus remains the tallest dog on record. Do you have a contender for the title of the biggest dog breed in the world? Tell us about your experiences in the comments below. Colin Selman et al. 2013. Ageing: It’s a Dog’s Life, Current Biology. Miller RA and Austad SN. 2005. Handbook of Biology of Aging (6th Edition). Academic Press. Lindbald-Toh K et al.. 2005. Genome Sequence, Comparative Analysis and Haplotype Structure of the Domestic Dog. Nature. Dinchev V et al. 2009. Comparable Karyologic Analysis of the Karakachan Dog within Canis Familiaris. Biotechnology & Biotechnological Equipment. Howell TJ, King T, Bennett P et al. 2015 Puppy Parties and Beyond: the role of early age socialization practices on adult dog behavior. Veterinary Medicine: Research and Reports. Sutter NB and Ostrander EA. 2004. Dog Star Rising: The Canine Genetic System, Nature Reviews Genetics. Acumen L. 2011 The Genetic Connection; a Guide to Health Problems in Purebred Dogs, Second Edition. American Animal Hospital Association Press. Previous articleIs Manuka Honey for Dogs a Miracle Cure?